William Carpenter was trained at the Royal Academy Schools. He was in India from 1850 to 1856, during which time he travelled extensively from Bombay (Mumbai) and across western India to Rajasthan, Delhi, Kashmir, Lahore and Afghanistan. His depiction of every day street scenes and groups of people is remarkably accurate and animated, his portraits vividly capturing the character of his sitters and the glowing effects of sunlight as cityscapes and architectural monuments. Brilliantly executed in a range of warm colours, his watercolours evoke a gentle romanticism. After his return to England, The Illustrated London News published some of his watercolours. In 1881, he exhibited 275 of his paintings in a one-man show in the South Kensington Museum, London. This entire collection was subsequently acquired by the V&A. This image shows the richly decorated interior of the Golden Temple. Worshippers are gathered around the Guru Granth Sahib, the sacred book of the Sikhs which, rests on a red cushion. 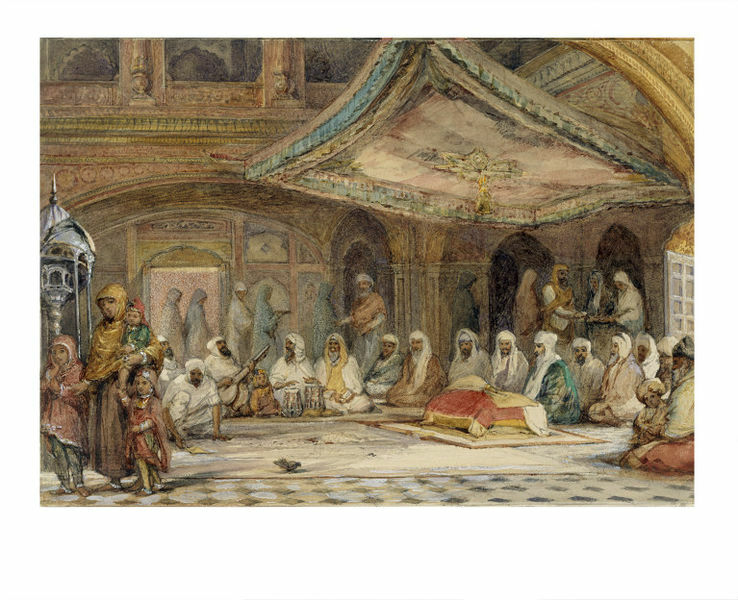 Through his use of colour, light and shade, Carpenter manages to evoke a sense of the spiritual nature of the ceremony. This view shows the richly decorated interior of the Golden Temple. Worshippers are gathered around the Guru Granth Sahib, the sacred book of the Sikhs which rests on a red cushion under a canopy. William Carpenter was trained at the Royal Academy Schools, and was the eldest son of the distinguished portrait painter Margaret Sarah Carpenter and William Hookham Carpenter, who became Keeper of the Prints and Drawings Department at the British Museum. He was in India from 1850 t0 1856, during which time he travelled extensively from Bombay (Mumbai) and across western India to Rajasthan, Delhi, Kashmir, Lahore and Afghanistan. His depiction of every day street scenes and groups of people is remarkably accurate and animated, his portraits vividly capturing the character of his sitters and the glowing effects of sunlight as cityscapes and architectural monuments. Brilliantly executed in a range of warm colours, his watercolours evoke a gentle romanticism. Interior of the Golden Temple, Amritsar by William Carpenter, paintings, watercolour on paper, India, 1854. 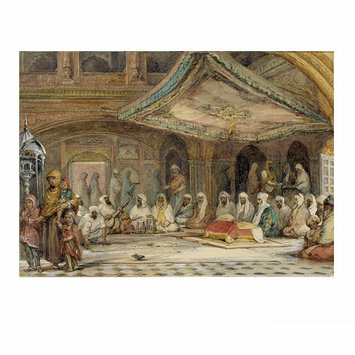 Rohatgi P. and Parlett G., assisted by Imray S. and Godrej P. Indian Life and Landscape by Western Artists: Paintings and Drawings from the Victoria and Albert Museum, 17th to the early 20th century. Published by Chhatrapati Shivaji Maharaj Vastu Sangrahalaya, Mumbai, in association with V&A, London, 2008. ISBN 81-901020-9-5.